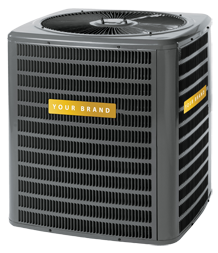 Now, the Retail Contractor Coalition offers any retail oriented contractor the ability to private label their brand on HVAC equipment. The equipment carries the same warranties from the manufacturer. Contractors receive the same technical and field support. They receive the same inventory and parts availability. Pricing and terms are negotiated locally. The contractor's liability is unchanged. The only thing that changes is the brand. Instead of a manufacturer's brand, a franchise brand or an alliance's brand, the private labeled contractor is promoting His Own Brand . The most aggressive retailing contractors took note of the no-frills product offerings, rolled them into their own branding initiatives, and began offering their own branded product.